Figure 9-48. Determining the new CG at fuselage station. Figure 9-49. Determining the new CG at station after CG has shifted aft. In a large cabin aircraft with high-density seating such as the B737-800, the operator must account for the seating of passengers in the cabin [Figure 9-50]. If assigned seating is used to determine passenger location, the operator must implement procedures to ensure the assignment of passenger seating is incorporated into the loading procedure. It is recommended that the operator take into account the possibility that some passengers may not sit in their assigned seats. Figure 9-50. One passenger configuration of a B737-800. If the actual seating location of each passenger is not known, the operator may assume that all passengers are seated uniformly throughout the cabin or a specified subsection of the cabin. Reasonable assumptions can be made about the manner in which people distribute themselves throughout the cabin. For example, window seats are occupied first followed by aisle seats, followed by the remaining seats (window-aisle-remaining seating). Both forward and rear loading conditions should be considered. The passengers may fill up the window, aisle, and remaining seats from the front of the aircraft to the back, or the back to the front. If necessary, the operator may divide the passenger cabin into subsections or zones and manage the loading of each zone individually. It can be assumed that passengers will be sitting uniformly throughout each zone. Flight deck crew members moving to the lavatory. Flight attendants moving throughout the cabin. Service carts moving throughout the cabin. Passengers moving throughout the cabin. Passengers moving to the lavatory. To determine changes in weight and CG when the aircraft is operated in its cargo configuration,the Beech 1900 is used as an example. Figure 9-51 illustrates the airplane configuration.Notice that the arm of each cargo section is the centroid of that section. Figure 9-51. Loading data for cargo configuration. 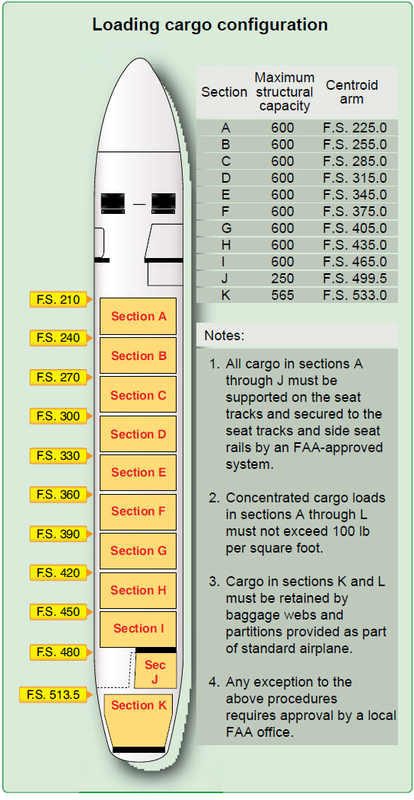 The flight manifest of the Beech 1900 in the cargo configuration is illustrated in Figure 9-52. The BOW includes the pilots and their baggage and there is no separate item for them. At the standard temperature of 15 °C, the fuel weighs 6.8 pounds per gallon. Refer to Figure 9-45 to determine the weight and moment index of 370 gallons of Jet A fuel. The CG under these loading conditions is located at station 296.2. To calculate the CG when cargo is shifted from one section to another, use the formula found in Figure 9-53. If the cargo is moved forward, the CG is subtracted from the original CG. If the cargo is shifted aft, add the CG to the original. Figure 9-53. Shifting cargo from one section to another. Figure 9-54. 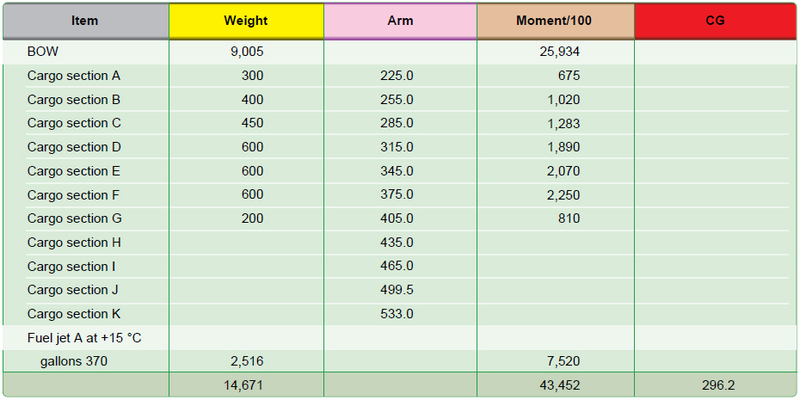 Determining the new CG by dividing the new moment index by the new total weight, multiplied by the reduction factor. When preparing an aircraft for flight,consider all parameters and check to determine that no limits have been exceeded. Consider the parameters below, and determine which limit, if any, has been exceeded. The aircraft in this example has a basic empty weight of 9,005 pounds and a moment index of 25,934 pound inches/100. The crew weight is 340 pounds and its moment/100 is 439. The passengers and baggage have a weight of 3,950 pounds and a moment/100 of 13,221. The fuel is computed at 6.8 lb/gal. The ramp load is 340 gallons or 2,312 pounds. Fuel used for start and taxi is 20 gallons, or 136 pounds. Fuel remaining at landing is 100 gallons, or 680 pounds. Maximum takeoff weight is 16,600 pounds. Maximum zero fuel weight is 14,000 pounds. Maximum landing weight is 16,000 pounds. Determine the zero fuel weight, which is the weight of the aircraft with all of the useful load except the fuel on board. [Figure 9-55] The zero fuel weight of 13,295 pounds is less than the maximum of 14,000 pounds, so this parameter is acceptable. Figure 9-55. Determining the zero fuel weight. Figure 9-56. Determining the takeoff weight and CG. Determine the landing weight and CG. This is the zero fuel weight plus the weight of fuel at landing. 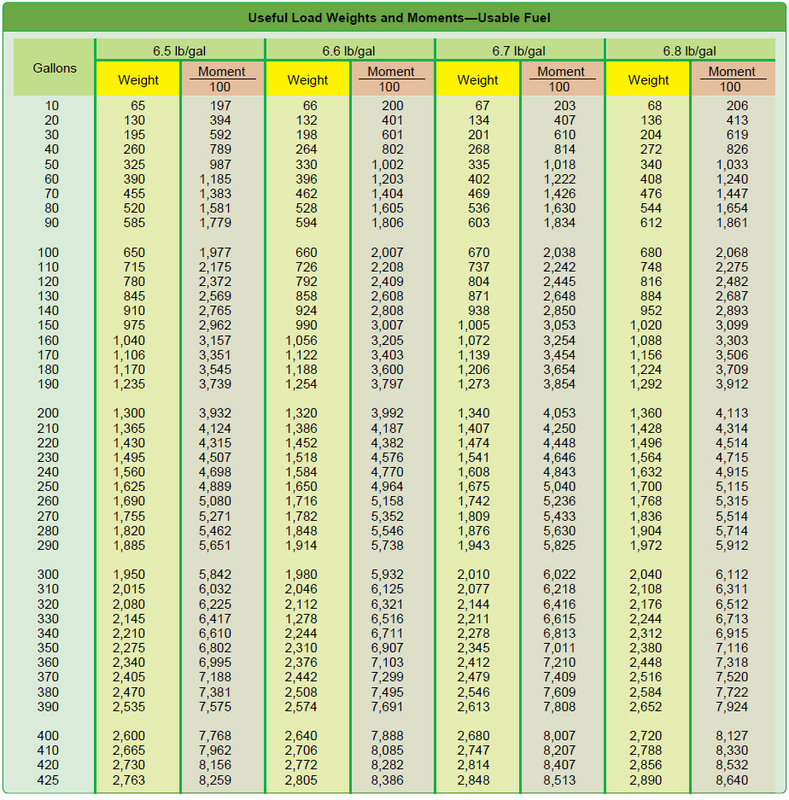 [Figure 9-57] The landing weight of 13,975 pounds is less than the maximum landing weight of 14,000 to 16,000 pounds. According to the weight and balance diagram, the landing CG at station 297.5 is also within limits. Figure 9-57. Determining the landing weight and CG.